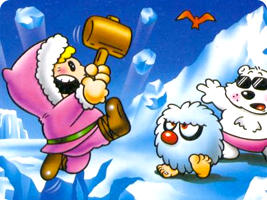 An early NES multiplayer game starring the ice climbers Popo and Nana. The pair must climb to the top of a number of perilous mountains to rescue vegetables from a red Condor. The original, largely forgotten game underwent a surge in popularity when the Ice Climbers were chosen to represent the Famicom as playable fighters in Super Smash Bros. Melee.